The Bauer Supreme S190 Hockey Shoulder Pads feature elite protection and performance without the big price tag. The Supreme S190 feature Poron XRD™, a foam that absorbs 90% of all high and low impacts to the sternum for professional protection. The lightweight, anatomical design allows for the most responsive feel and best power transfer with each movement. The Supreme series is all about protection so Bauer included Vent Armor foam in the floating sternum guard, kidney guard, spine guard and front panels. 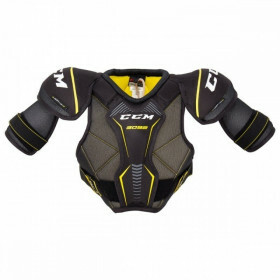 Vent Armor foam disperses energy away from the body while offering ventilation to cool you down while you play. The shoulder caps are designed to be lower profile while still maintaining good protection with molded plastic covered in medium density foam. 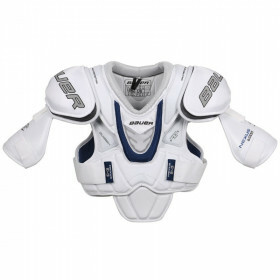 High density foams line the clavicle guard and the back panel for high impact protection. The interior liner features Thermo Max technology, which regulates both temperature and moisture control. An antimicrobial agent embedded in the fabric prevents bacteria formation and any odor, resulting in fresher gear. The three-piece design in both the front and back panels allow for a greater range of motion so you're movements aren't restricted.